Chester Holt is buried in The Garden of Love plot in Oaklawn Cemetery, Shelby Co., TX. He was married to Ella Windham on March 12, 1936 in Shelby County. He was later married to a Lola Lydia Innes Ballre on January 5, 1971. Elmer Chester Holt was born on December 12, 1894 to James Archibald Holt and Paulie Covington. He died on January 13, 1984 in Shelby Co., TX. He was a retired teacher. In the 1914 Center High Yearbook, Elmer was noted as being treasurer of the junior class, Vice President of the Crockett Society, and on the debating team. "Chet" hadn't been on campus two months before his silvery tongue and polished manner marked him as a politician. "A kind true heart, a spirit high, were written in his manly eye." In 1930 he and his first wife Ella were living with his in-laws, Julius Walter Windham and Tennie Lou Vail Windham, in Precinct #6 of Shelby County. In the 1939-1940 Teachers' Registration for the County of Shelby: Holt, Chester salary $1125 yrs. exp. 17 yrs. tenure 0 yrs. of college 3. "This Chester Holt is not a member of my Shelby County Holt family, but he is in the Holt family of Ray Jackson, the county coordinator for the Shelby County Genealogy Homepage. He has a family homepage at http://freepages.genealogy.rootsweb.com/~rayjac/. You will find Chester in this information. I connect to Chester through the Windham family; however, it is not a blood connection. I hope that I have given you a little bit of information to allow you to find out more about this man. 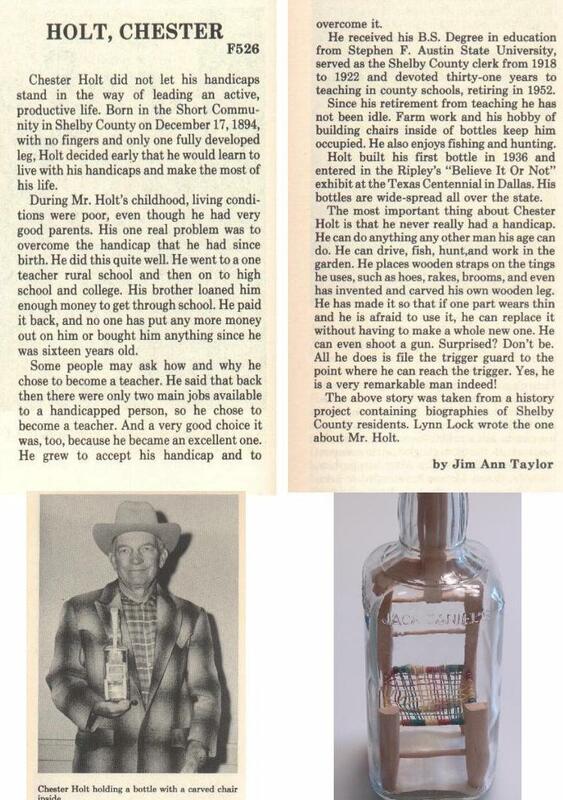 He seems to have conquered his disability by taking up such a painstaking hobby as building things in a glass bottle. Let me know what you find on Chester, I shall be interested in putting his history in my database for future reference. "